This is my first attempt at tackling another of the monthly daring challenges; this time we talk about Daring Cooks and Sushi!As with the Daring Bakers, the Daring Cooks virtually meet once a month to share their results on a chosen dish to realize following a specific recipe. This month it was the turn of sushi. It was not the first time for me, since I already had a go at it when I was in Florence 5-6 years ago. As with Macarons, this recipe is a lot about skills and technique. 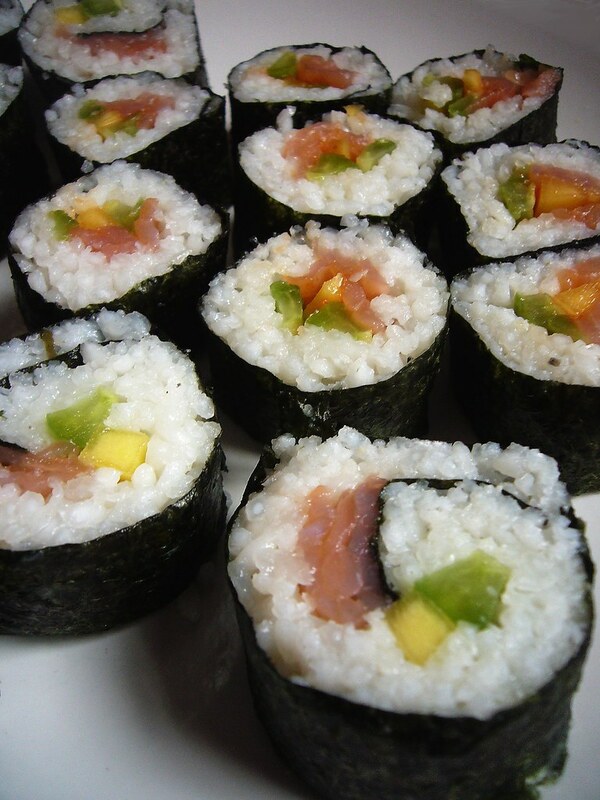 It is always said, at good reason, that the heart of a good piece of sushi is the rice. The short grained Japanese rice has to be slightly sticky so to keep its shape but loose enough to crumble once in your mouth. The rice itself doesn’t leak much starch when cooked, even because it is carefully rinsed beforehand; so to supplement it with taste and stickiness, a syrup made with water, rice vinegar, sugar and salt, is added to the rice during the cooling process. The rice keeps its loose identity, each grain recognizable and not smashed into a pulp but still quite sticky to give you trouble in laying it out on the sheet of nori seaweed (to avoid this you keep on wetting your hands when you handle the rice). As concerning the fillings, those are definitely up to the cook (naturally if you want to be traditional you might have some restrictions). 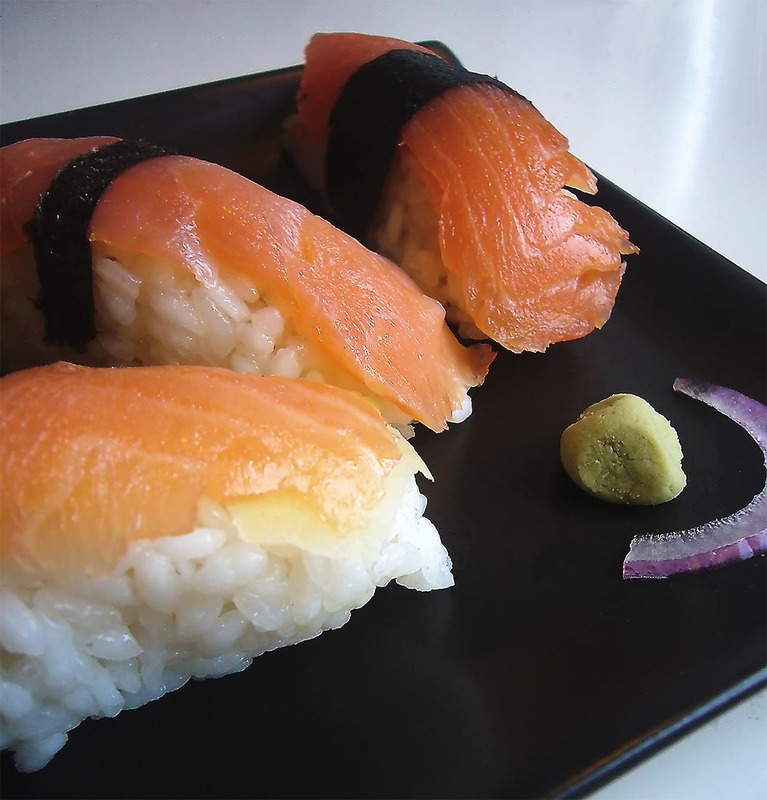 The rice keeps quite well for 1 or 2 days at room temperature so there is enough time to experiment, even by fixing you a yummy and elegant snack like a nigiri sushi (those delicate rice balls topped with a thin slice of fish, a piece of omelet or some vegetables). 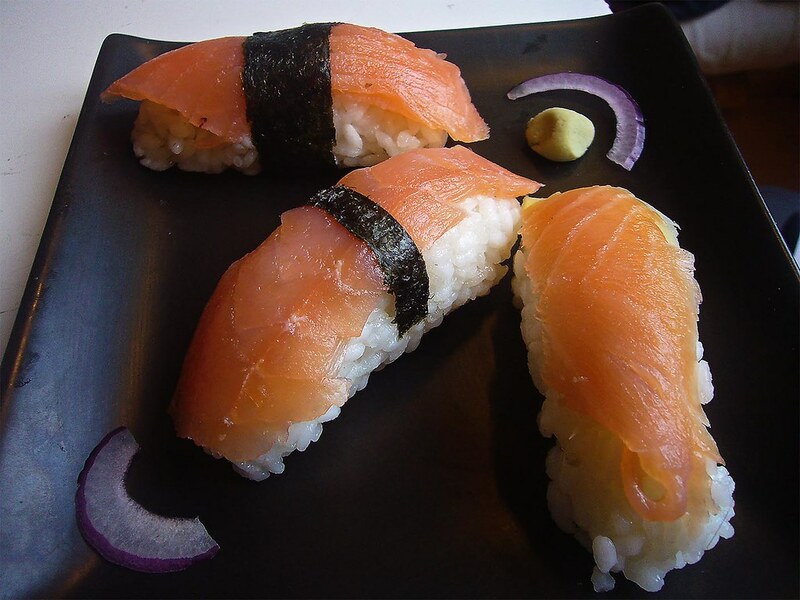 For this challenge we were asked by Audax of Audax Artifex and Rose of The Bite Me Kitchen to prepare the rice the traditional way, make a caterpillar or dragon sushi roll, a decorative spiral one and some nigiri (I will post the recipes at the end of the post). I made the rice yesterday, since it takes 1h30m to make, this morning I got woke up by a friend’s phone call (thankfully actually) and after the usual 20m of vegetation time I started fixing together some sushi and preparing my lunch (I was quite starving). The first one was the caterpillar roll. 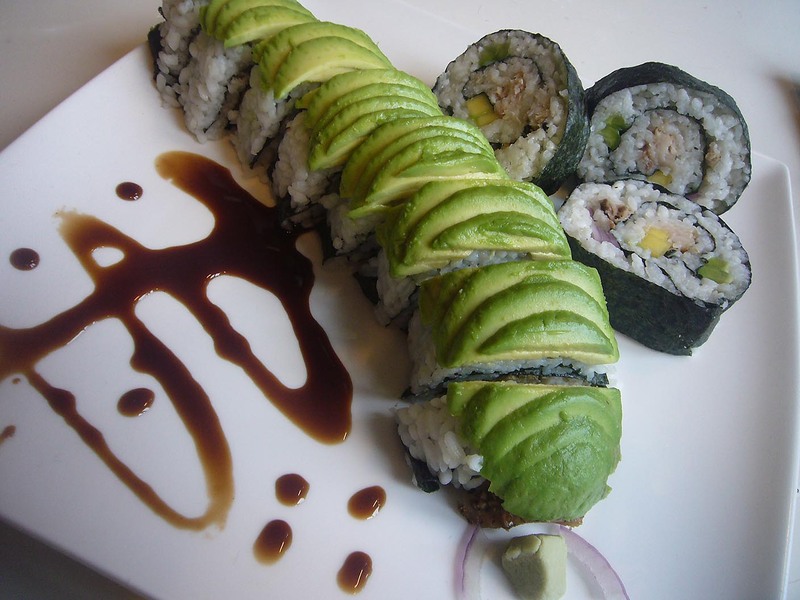 It is not very difficult to do, it is actually an inside-out roll covered with fanned slices of avocado. To build up the resemblance with the little animal, the cook usually uses many different sauces but I didn’t really want to make mine so saucy so I opted for a cleaner look highlighted with some hoisin sauce. This roll is usually stuffed using Japanese cucumbers and barbecued eels but since I didn’t find any eel I used a nice smoked and peppered king mackerel fillets. This was the first time I tried them and it is really good stuff: moist fatty meat with a hint of smoke and cracked pepper on top, Yum! The decorative spiral roll is a big one made by joining together two sheets of nori and placing the various filling at regular interval so to create in the slice an alternation of rice and colorful ingredients in a spiral pattern delimited by the dark seaweed. For it I used again the cucumbers, the mackerel, some mango and red onions. 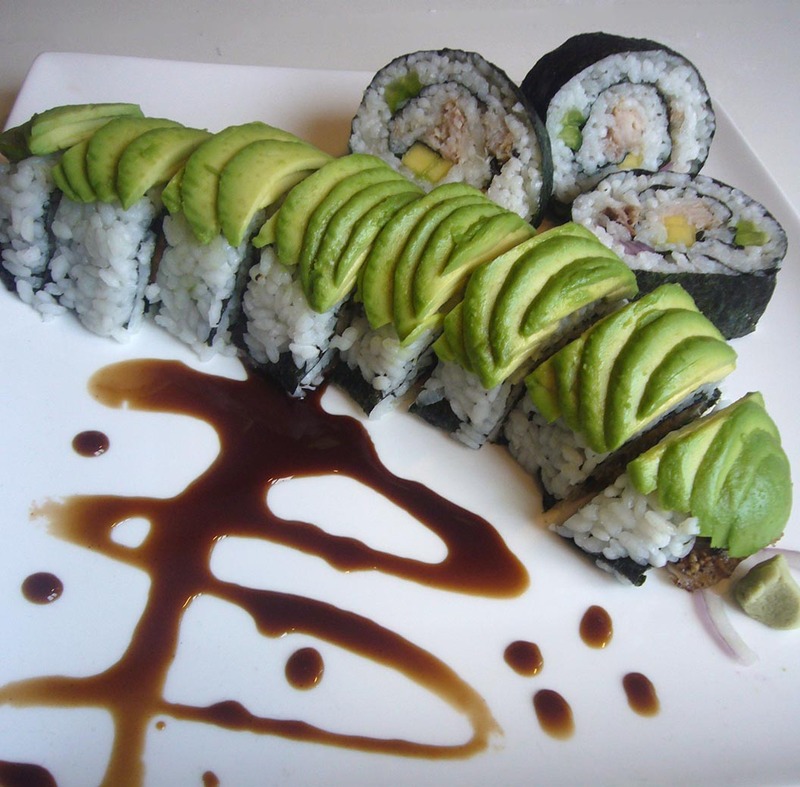 This roll was less challenging to prepare since it is a classic one with the seaweed at the exterior, still I did not put enough rice on it and the border was still a bit empty giving two sad extremal slices. The nigiri were pretty straightforward, at first sight I know. Here the consistency of the rice plays the major role in the gustatory experience and technique is a must. Since these are formed by shaping a log of rice using your hands, you can risk to ruin the crumbly consistency of the rice by pressing it together too hard. As topping I chose to use smoked salmon and mango. Making sushi is quite fun and it makes the perfect lunchbox, tasty and light (a bit too light for my taste but that’s another story). So let’s do it more often! These look very attractive. 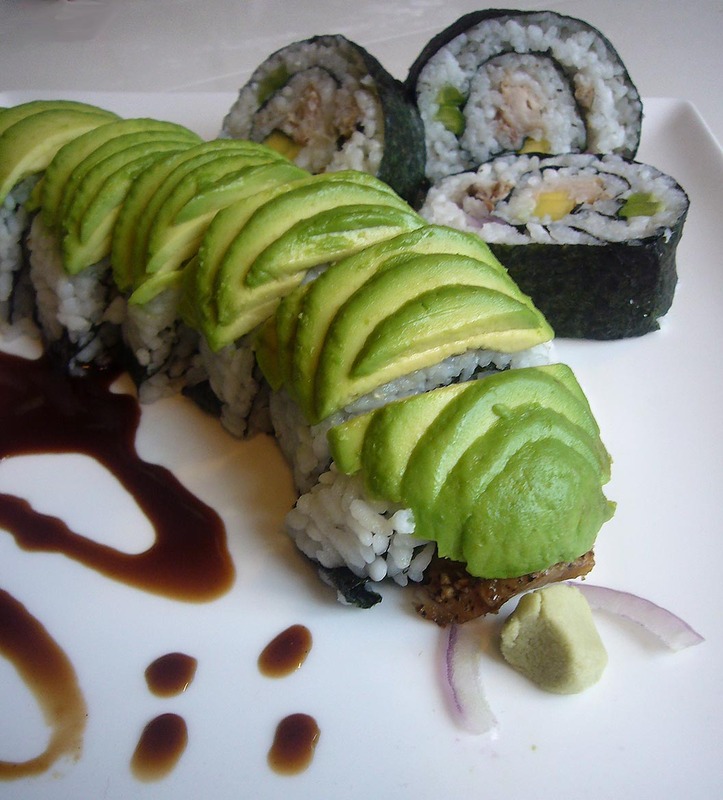 I could do with some wasabi right now. Beautiful and quite delicious... Looks like you had a whole lot of fun doing it too!